One of the greatest challenges facing chemists and chemical educators today is conveying the central importance and relevance of chemistry to students and society at large. The new edition of Chemistry Connections highlights the fundamental role of chemical principles in governing our everyday experiences and observations. 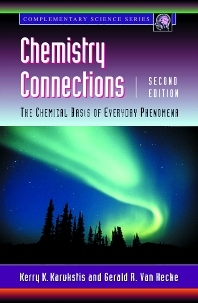 Introductory chemistry students and educators as well as laypersons with an inquisitiveness about the world around them will find the book an informative introduction to the context of chemistry in their lives. The book is written in a lively question-and-answer format with presentations in both lay and technical terms. "...wonderful and fun...buy one...and use it every day to add relevant examples to all your chemistry courses." Dr. Kerry K. Karukstis is Professor of Chemistry at Harvey Mudd College in Claremont, California. She received her Bachelor of Science degree in Chemistry in 1977 from Duke University and her Ph.D. in Physical Chemistry in 1981from Duke University. Prior to her arrival at Harvey Mudd College in 1984, she was a National Institutes of Health Postdoctoral Research Fellow at the Laboratory of Chemical Biodynamics at the University of California, Berkeley. Her research interests involve applications of absorbance and fluorescence spectroscopy to surfactant assemblies (micelles, reverse micelles, vesicles, liposomes) and host-guest systems (cyclodextrins, dendrimers). She is co-author with Gerald R. Van Hecke of A Student's Guide to Lasers in Chemistry, a monograph for undergraduates on applications of lasers in chemistry. She is a member of the American Chemical Society, the American Society for Photobiology, the Biophysical Society, the Council on Undergraduate Research, Phi Beta Kappa, and Society of the Sigma Xi - The Scientific Research Society. She is also currently a Councilor for the Chemistry Division of the Council on Undergraduate Research. Her curricular initiatives have focused on two areas: introducing undergraduate applications of lasers in chemistry and incorporating biophysical applications and experiments in physical chemistry courses andlaboratories. Harvey Mudd College, Claremont, CA, U.S.A.
Dr. Gerald R. Van Hecke is Professor of Chemistry at Harvey Mudd College in Claremont, California. He received his Bachelor of Science degree in Chemistry in 1961 from Harvey Mudd College and his M.A. and Ph.D. degrees in Physical Chemistry in 1963 and 1966 from Princeton University. Prior to his arrival at Harvey Mudd College in 1970, he was a Chemist at Shell Development in Emeryville, California. His research interests involve studies of liquid crystalline materials, from synthesis of new materials to their characterization bythermodynamic and spectral measurements. He also uses laser light scattering to measure thermodynamic properties of mixtures of simple liquids. He is co-author with Kerry K. Karukstis of A Student's Guide to Lasers in Chemistry, amonograph for undergraduates on the applications of lasers in chemistry. He is a member of the American Chemical Society, the International Liquid Crystal Society, the Council on Undergraduate Research, and Society of the Sigma Xi - The Scientific Research Society. His curricular initiatives have focused on introducing undergraduate applications of lasers in chemistry.